After a successful decades-long career in IT and running a company in the national security arena, I became enlightened about what it means to be healthy by watching “Forks Over Knives”. Six years ago, I lost my fiancé to heart disease suddenly at the young age of 50, when he still had kids in high school and college. As a South Carolinian, his meals were always fried or barbecued, and always included large portions of animal flesh. As a mostly vegetarian since my twenties, I thought that low carb diets were the key to staying slim and fit. Forks Over Knives provided a wake-up call and was such a hopeful and powerful message; people aren’t destined to suffer or die from heart disease (or most of the common chronic illnesses in our country) if they choose a whole plant diet free of the addictive salt, sugar, and fat. I reached out to T. Colin Campbell, who was kind enough to meet with me and ignite my mission to share this knowledge with others whom I thought could benefit. 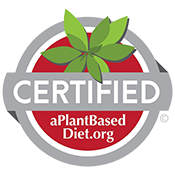 This past May, in partnership with Colin’s oldest son, Nelson, I ran a KickStart program (shown in the film PlantPure Nation) in Reston with 45 friends and associates who were willing to change their diet for 10 days: blood testing was done before and after, 10 days of oil free whole plant food was provided, and Colin Campbell graced us with his presence at our kickoff. I also had the fortunate introduction to Pericles Silva, who supported the KickStart. Pericles is an institution in this area, having a background in sports nutrition and leading the healthy eating program at Whole Foods in Reston. He had spent years studying the same doctors I had started supporting and our combined knowledge enabled future plans. Across the board, results were amazing. People lost weight, their cholesterol dropped by roughly 20% (some much more), and many discontinued medications. All in just 10 days. I started getting phone calls and thank you notes saying that this diet had changed their life. How to continue spreading the word and increasing long term success? I decided that it must be by providing food and education reinforcing it through a community of people who care about their health, and the impact of food choices on the environment and animal welfare. 95% of people surveyed in a recent poll are against animal cruelty; you need only watch a few videos to recognize that compassion and integrity are absent from animal production. The decision was made in April to find an existing space; Keith Black and Pericles supported a few months effort that ended up where we first looked: at the KMart Shopping Center to the far right of another local favorite, Mom’s Organic Market. We are moving fast and furiously to bring this knowledge and inspiration to the local community; great food can taste amazing and heal your body as it aligns with the optimal diet promoted by the science. We welcomed close friends to a soft opening a week ago to a warm reception and sold out venue and look forward to Sunday, November 1st, National Vegan Day, coincidentally. We are bringing certified organic whole plant food, locally and sustainably prepared with love and hope that GreenFare becomes a cherished part of the local community.